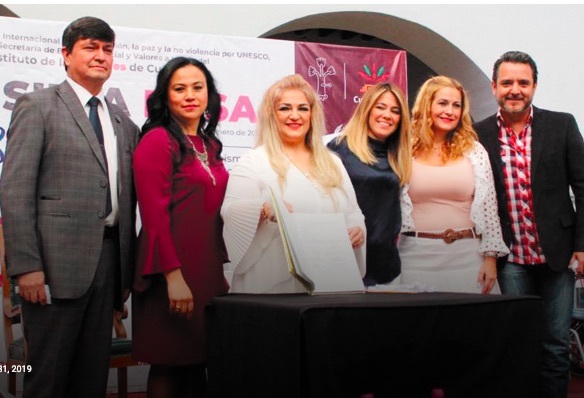 The mayor of Cuernavaca, Antonio Villalobos Adán, has signed the “Peace Accord”, to launch the program Silla Rosa [Rosa’s Chair], headed by the Secretariat of Social Welfare and Values. “The purpose of the program, presented to civil society, business representatives, human rights defenders and leaders of the city, is to reduce rates of violence against women,” said the mayor. After recognizing that one of the priorities for the municipal government is to develop an environment without violence and peace, Antonio Villalobos Adán urged all sectors to join in these preventive actions. The “Peace Accord” was signed by municipal authorities, representatives of the United Nations (UN) and the United Nations Educational, Scientific and Cultural Organization (UNESCO). Speaking at the City Museum, the mayor stressed the importance of joining the campaign “The culture of peace”, promoted by international organizations so that all families have the right to live within a just and lasting peace, in a state of tranquility and balance. Meanwhile, peace ambassador Larissa Navarro said that the Silla Rosa program is a symbol of women’s rights and obligations, how to instruct children and their families in peace, with the engagement of men. In her speech, the Secretary of Social Welfare and Values, Cynthia Pérez Suero, reported that during these 30 days a thorough work has been done to find out the real situation, in order to implement projects and programs in favor of the society. During the working meeting the representatives of the UN, UNESCO, Mayor Antonio Villalobos Adam and civil society inaugurated the Itinerant Book and signed the “Peace Accordt”. It should be noted that the document was symbolically signed with “white gloves”, as a rejection of violence.